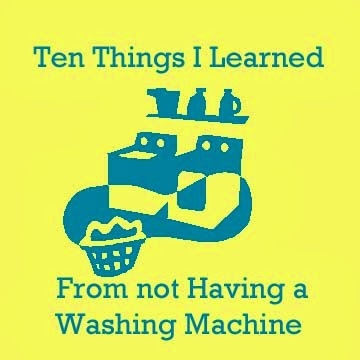 Washing clothes in the bathtub is lots of fun for the kids, but not so much for mom. It also doesn't really get things very clean. A potato masher makes a great agitator when you decide to try washing clothes in the kitchen sink. The kitchen sink works much better than the bathtub. Drying racks make attractive living room decor, especially covered with socks and underwear. Laundromats smell much better on the outside than on the inside. We own a lot of clothing! It only takes two loads in the new washer/dryer before I started finding mulch and rocks inside. Our bathroom is not large enough to hold three weeks worth of laundry and still be able to navigate through, but my new washer is big enough to go through that much laundry in about 5-6 loads!